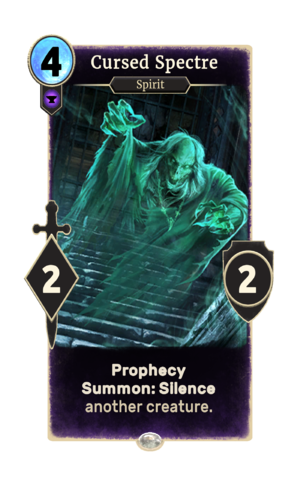 Cursed Spectre is a common Endurance creature card. It is part of the Core Set. In addition to the card's availability in the Core Set, two copies are included in the Tribunal Glory theme deck, and one copy in the Imperial Might deck. "Death comes to us all." "The living have no place here." Based on the caption on the illustrator's site, the card was originally going to be called "Faded Wraith". This card's summon ability applies the Spectral Curse card effect. This page was last modified on 16 February 2019, at 12:56.